Rosalie Lang's work has always focused on the fine details of surfaces natural and otherwise. Lang's current paintings feature an indepth study of geological elements. 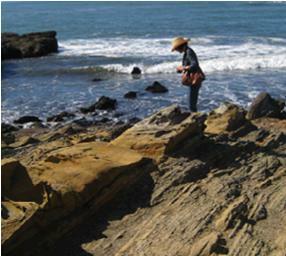 In retrospect, she credits the direction of her work to a range of experiences: endless rock hunts wherever she lived, the appearance of a seashell-impregnated fossil in her backyard--a fragment of a vanished underwater world, and many return visits to photograph rocky coastal areas of California. A native New Yorker and longtime resident of California, Rosalie Lang graduated from Queens College, City University of New York receiving a Bachelor of Arts degree in Art and Education. She continued her art training in both oil painting and photography, earning a Master of Science degree at Pratt Institute, NY. Awarded an NDEA Title IV Fellowship, Lang went on to research Art Education methodology in the Graduate Program at New York University and earned a Doctorate of Education. As an Assistant Professor, Lang taught Art Education at The College of New Jersey, Ewing Township, NJ and at San Jose State University, San Jose, CA. The Formations Series has been an encompassing experience for Lang. It brings together a range of continuing interests--geology, photography, rock collecting, intricately detailed patterning. It paves the way for Lang to explore and then bring forth the mystery and beauty of delicate, lace-like surface configurations. 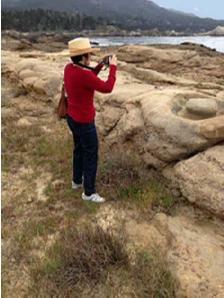 An important element in Lang's journey is the photographic record she maintains of her visits to coastal areas. Many of those photographs are included in an album documenting the location and appearance of each selected rock formation and its corresponding painting. The Formations paintings are exhibited in a number of venues including the National Academy of Sciences in Washington, DC and the Pacific Grove Museum of Natural History, Pacific Grove, CA. In addition to gallery shows on both coasts, Lang’s professional exhibition record includes: Monterey Museum of Art, Monterey, CA, Art Museum of Los Gatos, Los Gatos, CA, New Jersey State Museum, Trenton, NJ, Morris Museum, Morristown, NJ, and Jersey City Museum, Jersey City, NJ. 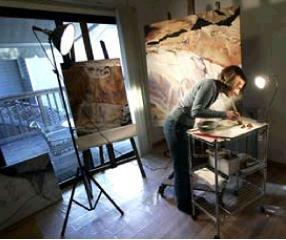 Her work is represented in numerous public and private collections.